bet365 Gold Cup Handicap Chase 3m5f Sandown Saturday – First run as the Whitbread Gold Cup in 1957, it was the first commercial sponsorship in British sport, and in its early years, the classier animal at the top end of the handicap tended to dominate. It’s first two decades saw five Cheltenham Gold Cup winners come home in front, but in the subsequent fourty years, Desert Orchid in 1988, has been the single winner of Cheltenham’s Blue Riband, to figure on the role of honour. Indeed it has become a contest where the lighter weights have had the better of the argument, with twenty three of the twenty eight winners since “Dessie’s” victory, carrying less than eleven stone. Experience counts for plenty with eight of the last ten winners having had a minimum of ten outings over the larger obstacles, and significantly all ten had a previous run within eight weeks of their victory. A win going right handed, and success over at least three miles, have also proved essential. Paul Nicholls with three wins holds the training honours with Henderson and Hobbs sharing the runner up spot with two each. The latter’s sole representative, Rock The Kasbah, racing off a mark 8lbs lower than his rating over hurdles, (150) looks interesting. The 7yo has won going right handed, winning a Grade3 Hurdle at Ascot, and won a Chepstow 3m Chase on soft ground in February. He looked a bit one paced finishing second over three miles at Uttoxeter last time and could be suited by the step up in trip. Worth considering! The 2016 winning trainer, Neil Mulholland is triple handed. He runs last year’s short head victor, The Young Master, fifth placed, The Druids Nephew, and the recent easy Cheltenham winner, Doing Fine. The first named races off the same mark but with 11-5, (including Walley-Cohen’s 3lbs claim) has 7lbs more to carry than last year and has been disappointing in his three races this term. The same can be said of The Druids Nephew, but with a 10lbs lower mark than last April, and with Noel Fehily riding, he is not so easy to dismiss. He was slightly hampered at the 19th in last year’s contest, so did well to finish 5th, 7L behind the winner, and I suppose 7th of 23 runners (although beaten 29L) at the Cheltenham Festival last time, doesn’t read too badly. However, Mulholland’s third contender, Doing Fine, with the featherweight of 10-03 in the plate looks to have the best chance of the trio. He had been a promising young horse for Rebecca Curtis, winning twice, and on one occasion, gave the useful Cogry, a run for his money over 26f at tricky Warwick in February 2015, before losing his way. The move to The Mulholland yard has proved a success. He went down by a neck, over Saturday’s course and distance, to the useful Rocky Creek in December, followed by a good second at Wincanton, and last time he got back to the winners’ enclosure, with that impressive win at Cheltenham over 28f, ten days ago. He will enjoy the good ground at the weekend, has won going righthanded and with his light weight will think he’s running loose. Paul Nicholls, who after his Scottish National win last week, must be still entertaining hopes of retaining his Trainers’ title, also runs three. However with 11-12 and 11-9 to carry both Southfield Theatre and last year’s short head runner up Just A Par have a very difficult task indeed, so perhaps the Novice, Present Man (pictured top), represents the best chance of keeping the Master of Ditcheat in the title race. A winner of four of his eight chases, including a Doncaster 3m Grade2, he won at Ascot 27 days ago over an inadequate 21f, and as a son of Presenting, out of a Strong Gale mare, Saturday’s test over eight furlongs further, on good ground, might prove right up his street. With Jack Sherwood taking 3lbs off he will have a nice racing weight of 10-13, and looks to have plenty to recommend him. Considering he is a double Grade2 winner over hurdles, and a winner at the same level over fences, Nicky Henderson’s 8yo Vyta Du Roc, looks very well treated on a mark of 137 which puts him in Saturday’s race with 10-11 on his back. Vyta Du Roc looks well handicapped for Saturday’s big one. He has disappointed in his last two races, (lost a shoe last time) but did run a decent race in the Hennessy Gold Cup when finishing 6th, nine lengths off the winner Native River off a mark of 143. Having avoided the Cheltenham and Aintree festivals he will strip a much fresher animal than many and is worth considering. Paddy Brennan who usually partners Theatre Guide has jumped ship to take the ride on Fergal O’Briens Viva Steve. The 9yo looked good when winning at Ayr in November following a six-month break, but disappointed in his next two races. Perhaps he is best caught fresh, and following a nice nine week holiday, might prove the surprise package. Preview: Scottish Grand National 4m Ayr Saturday – Last year’s winner, Vicente did the Oddsguru proud when coming home in front at the rewarding odds of 14/1, and racing off the same mark this year, a repeat is certainly not out of the question, as it is a contest that has been good to those who have performed well in it before. For example, Godsmejudge followed up his win in 2013, with a second in 2014, and Merigo, sandwiched in a second, between his two wins in 2010 and 2012. However, it has to be said that Vicente, having come a cropper at the first in The Grand National two weeks ago, doesn’t seem to be in the same form as last year, when running a race full of promise in Cheltenham’s 4m National Hunt Chase to finish fifth, prior to coming here. On the plus side, this is definitely his time of year, and there seemed to be plenty of confidence in him at Aintree before his unlucky fall at the first. His early exit will have saved him from a hard race so is not one to lose faith in, and he could yet join the elite band of Queens Taste, Androma and Barona who have won this in consecutive years. The Nicholls yard have another strong contender with the 7yo Novice, Arpege D’Alene. By the same sire, Dom Alco, as Vicente, he also demonstrated his stamina credentials, when staying on to finish 4th in this years renewal of the National Hunt Chase. Hampered after three out, he rallied under pressure to finish six lengths behind the winner, Tiger Roll. He races close to the pace, always a plus in this contest, and will enjoy the likely decent ground, but I just wonder if his burden of 11st6lbs might find this Novice out. Nicky Henderson has never won this, or indeed any other “National” but does have a really strong looking candidate with Premier Bond. A 7yo son of Kayf Tara out of that terrific race mare, Celtic Native, who won ten times for Philip Hobbs, and ran third to the great Barracouda in the 25f Longwalk Hurdle, should find Saturday’s 4m test right up his street. Beaten 14L by his super star stable companion, Might Bite, over an inadequate 19f last December, he put up strong staying performances to win his next two Novice chases. Sent off a 9/1 shot for the 24 runner, 26f, Kim Muir Chase at the Cheltenham Festival, despite being hampered at the first, he stayed on strongly in the closing stages to finish 3rd, 1 1/2L behind the winner. He races on Saturday off a mark only 2lbs higher than Cheltenham, giving him a nice racing weight of 11st, and the 7yo might just prove to be the first to bring a “National” home to the Master of Seven Barrows. The Neil Mulholland trained Southfield Royale ran a fine race in that 2016 renewal of the National Hunt Chase, won by Minella Rocco, with subsequent Gold Cup runner up Native River in second, and Ayr hero Vicente back in 5th, to finish 4th, but the wheels seem to have come off since. Well beaten at Punchestown in April, he trailed in 12th of 14 on his reappearance in January. Connections seem to have kept the faith, because he was sent off a well backed 7/1 shot for the Kim Muir, where he fell at the ninth fence. I suppose he remains an animal of some potential, and as a son of Presenting, should be well suited by decent ground at the weekend, but one has to wonder if his jumping will stand the test. The Warren Greatrex trained, Missed Approach, certainly didn’t look a 50/1 chance when putting up a great performance to finish 2nd in this years renewal of The National Hunt Chase. Having raced prominently throughout, the 7yo was 8L down after the second last and stayed on stoutly to get within 3L of the winner Tiger Roll. A prominent racer with bags of stamina is what is required for the Ayr fourmiler and the Greatrex contender certainly qualifies on these two fronts. However weight is a negative and with top weight of 11st9lbs to shoulder he has it all to do. However Missed Approach is clearly an animal on the “up” and might well give pilot Leighton Aspell a Scottish National to add to his two Aintree triumphs. Jonjo O’Neill’s Another Hero, should enjoy the step up in trip, and will like the good ground forecast for weekend. He stayed on into fourth place in a 3m Ascot Handicap in December and again ran well over Doncaster’s 3m in January to finish 3rd. There was money for him in the Kim Muir at the Festival, but badly hampered at the 9th fence, he never got back into the race and finished 13th. By Kalinisi out of a Strong Gale mare, 4miles on good ground should suit and with his nice racing weight of 10st10lbs is worth considering. The Nicky Richards trained, Looking Well, has won four of his thirteen starts, and all four victories have come in either April or May. He is another with a nice racing weight of 10st12lbs and he looked a strong stayer when winning over 26f at Kelso last May off a mark of 122. He ran another solid race when finishing 2nd to Ziga Boy off a 10lbs higher mark in January over 3m. He can be forgiven his last run on unsuitably soft ground in March and should find conditions in his favour on Saturday. With useful 3lbs claimer, Ryan Day in the plate worth considering. 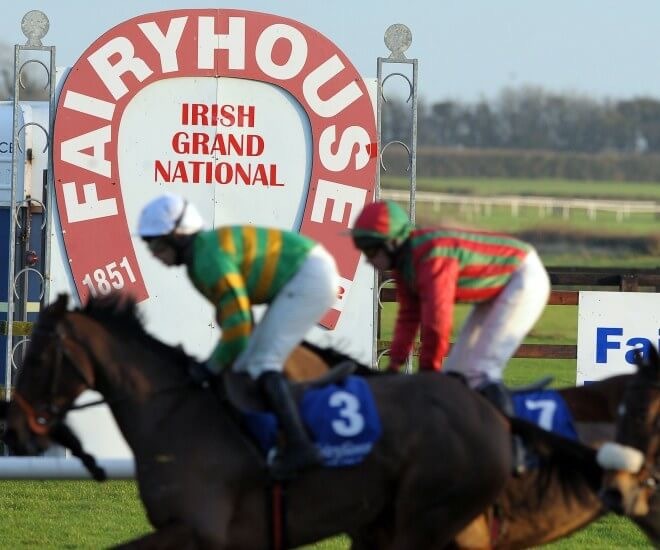 BoyleSports Irish Grand National Handicap Chase 3m5f Fairyhouse Monday – Last week’s selection, Blaklion, ran a smashing race to finish fourth in the Grand National and if only, pilot Fehilly, had been able to hold onto him for a bit longer, he may well have gone very close. However the race was won by an exceptional stayer who could well figure in Cheltenham’s showpiece next year, and it was great to see all forty runners return unscathed in what was the 170th renewal of the great race. Fairyhouse stages merely the 145th renewal of the Irish equivalent on Monday, and let’s hope for a similar happy outcome there. With a maximum field of thirty the Irish edition looks an easier puzzle to solve than Aintree, but with only one favourite, (8/1), a 50/1, and three 33/1 shots winning in the last decade, it has proved anything but. However, it is a contest with some particularly strong trends, not least the significance of weight. 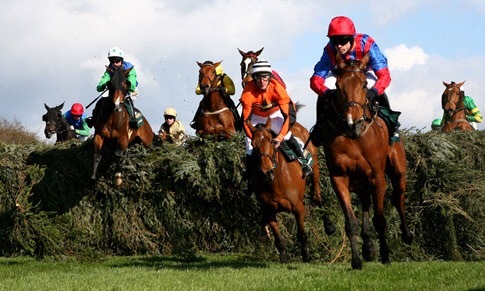 Only two animals, the Gold Cup placed Commanche Court, (2000) and Aintree Hero Bobbyjo (1998) have managed to carry more than 11st to victory in the past twenty years. Age has also been significant with only two 6yo’s making it to the winners enclosure since 1973, and 11yo’s are nearly as infrequent visitors, with Jenny Pitman’s Mudahim twenty years ago, the last to succeed. The most successful age group have been the 7 and 8yo’s with surprisingly, for such a competitive race, plenty of Novices,(21 in the last fifty years) coming home in front. A recent outing, and a win going right handed, have also been important. Mouse Morris has been the most successful handler with two wins in the past decade, but a surprising absentee from the roll of honour is Willie Mullins. Dad, Paddy, won the race four times, but Willie has failed to hit the back of the net, and indeed has drawn a blank from twenty runners in the last ten years. Eddie Harty has never won the race either but looks to have a strong candidate with his 8yo Minella Foru. This son of Kings Theatre out of a Topanoora mare was always going to be a staying chaser, and so it proved when stepped up to three miles in the 2015 running of The Paddy Power Chase, he stayed on strongly to beat the useful Ucello Conti. Sidelined for over a year he made a satisfactory reappearance in a Grade2 Hurdle at Naas in January. Fairly handicapped, and in the Green and Gold colours of JP McManus, he is worth considering. Following his three Cheltenham Festival wins and four further victories at Aintree, man of the moment, Robbie Power, will be hoping for further success when he climbs aboard the Jessica Harrington trained Our Duke on Monday. The 7yo Novice has only had the three races over fences, winning the first two and coming second last time. He comfortably won a 2 1/2m Navan Novices in December, and took a big step forward nineteen days later when winning a Leopardstown Grade1 over three miles. Last time he was putting in all his best work at the finish when beaten by Disko over an inadequate 21 1/2f again at Grade1 level. Well found in the markets, he looks a danger to all particularly if there is “soft” or “yielding” in the going description. Ever since winning a 3m6f handicap at last years Punchestown Festival off a mark of 138, Harry Fry has had the Irish Grand National in mind for his talented 9yo, Fletchers Flyer. He did his prospects no harm when finishing a good third in an Ascot Grade2 conditions event over three miles eight weeks ago, and will relish the step back up in trip on Monday. He looks well treated on a mark of 145 and has to be on the shortlist. Could the Crafty Butcher be the one to at last fill that gaping hole in the C.V. Of the Master of Closutton? He has never won beyond three miles, but the way he finished in the hugely competitive, 24 1/2f, twenty eight runner Paddy Power Chase at Christmas strongly suggests that this 10yo could be well suited by a step up in trip, and racing off a mark of 135, could put an even broader than usual smile, on the visage of Willie Mullins come Monday evening. Despite being given too much to do in Cheltenham’s 3m2f Kim Muir, and meeting trouble at the second last, the Patrick Kelly trained Mall Dini ran a great race to finish 5th only 3L behind the winner. Surprisingly, this hero of last years three miles Pertemps Final at the Festival, has yet to score over fences, but his run in the Kim Muir was certainly a move in the right direction. Well suited by good ground, and only 1lb higher than his Hurdles mark, this 7yo has his best years in front of him, and it will come as no surprise if he breaks his steeplechasing duck on Monday. With our selections finishing second in the last two renewals of the great race, the Oddsguru is due a change of fortune, so here’s hoping that this year we can highlight that special animal, with the right blend of pace, stamina, and above all courage, to take home Saturday’s great prize. Our selection last year, The Last Samurai, ran a superb race to finish second, and showed that the fire was still burning brightly, when finishing second to Definitely Red in that good Grand National Trial, The Grimthorpe Chase at Doncaster in Febuary, a contest he won in 2016. However, he now carries top weight, leaving him with a burden 16lbs higher than last year, obviously posing a rather serious question. Despite that, his great run last year, remains fresh in the memory, and it will come as no great surprise to see him jumping the last in contention again. Irish training sensation, Gordon Elliott, who handled the 2007 winner, Silver Birch, runs two likely looking types, Cause of Causes and Ucello Conti. Having now won at three consecutive Cheltenham Festivals the former is beginning to acquire mythical status, and it will come as no surprise if this hardy, brave, and amazingly versatile animal gets his head in front on Saturday. Stable companion, Ucello Conti, a half brother to that outstanding chaser, Silviniaco Conti, also has plenty to recommend him. This ex French 9yo has been jumping steeplechase fences since he was three and as a relatively new recruit to the Elliott Academy ran a solid race to finish sixth in last years renewal. Elliott always thought that the son of Martaline was a “natural” for Aintree and having had him for another twelve months could well be proved right. Having won the Grand National twice, with Earth Summit in 1998 and Bindaree four years later, Nigel Twiston-Davies certainly knows what is required, and his talented 8yo, Blaklion, has the ability to take his score to three. When, probably needing the race after a break, he put in an eye catching performance finishing second to current market leader, Vieux Lion Rouge in Haydock’s Grand National Trial over 3m4f on stamina sapping ground. He looked like making all until lack of full match fitness told close home, and post race vibes from his excellent trainer strongly suggested that placings would be reversed come the big day in April. Blaklion, as a Grade2 winner over hurdles, and a Grade1 victor over fences has that touch of class, and as one who can race up with the pace, (often the safest place to be at Aintree), has to be on the shortlist. Lucinda Russell’s 8yo, One For Arthur looked an out and out stayer when winning easily over 26f at Kelso last October, and confirmed his stamina credentials when winning The Warwick Classic,(previously The Warwick National), from nineteen other runners, over 3m5f on holding ground in January. He had previously shown that the big Aintree fences hold no fears for this good jumper, when getting to within 3L of Vieux Lion Rouge in the Betfred Beecher Chase over the course, running on with great resolution. Definitely worth considering, particularly if the ground comes up soft! The prize has come back to the village of Nicholashayne in Somerset twice previously, courtesy of Minnehoma in 1994, and Comply Or Die nine years ago, and the Pipe yard will be hoping for further celebrations on Saturday night. They certainly have a very progressive looking candidate in current market leader Vieux Lion Rouge. Starting as an unconsidered 66/1 outsider in last years renewal, he outran his odds to finish seventh, a highly commendable effort for a seven year old in the National. Winner of the Beecher Chase over the Aintree fences and the Grand National Trial at Haydock, underlines his progress this term, and with another year under his belt looks a worthy favourite. Astonishingly, Trevor “Blackpool Tower” Hemings, has won three of the last twelve renewals of the great race, and his recent purchase Vicente, will be attempting to join his three previous winners Hedgehunter(2005), Ballabrigs(2005), and Many Clouds(2015). The Paul Nicholls trained 8yo won last years Scottish National as a novice, and thanks to four subsequent lacklustre efforts, gets into Saturday’s contest on only one pound higher. These poor efforts can be ignored as Vicente is very much a “Spring Horse” who reserves his best for this time of year, and with his nice racing weight of 10st10lbs has to be considered a live outsider, to give Mr Hemings a fourth success, and indeed his trainer a second, (Neptune Collonges 2012). Brian Ellison’s 8yo, Definitely Red, has been popular in the ante post markets since his impressive win in The Grimthorpe Chase at Doncaster, (after the weights for the Grand National were published) and this strong stayer does look well handicapped with 10st12lbs on his back. Worth considering!